I got a new stamp set!!! Woohoo!! I finally order Priceless, and it came this week!! It's such a pretty set--with all the swirls and flowers and butterfly!! Here is my first card made with this set! I used Groovy Guava, Rose Red and Brocade blue. The "bling" is three rhinestone brads--the square "Ice". These are so pretty IRL!! I hope you all enjoy a great Labor Day Weekend!!! Last night after dinner, I sat down again at my desk and started playing!! I came up with another card for this week's sketch challenge! I like this one much better!! 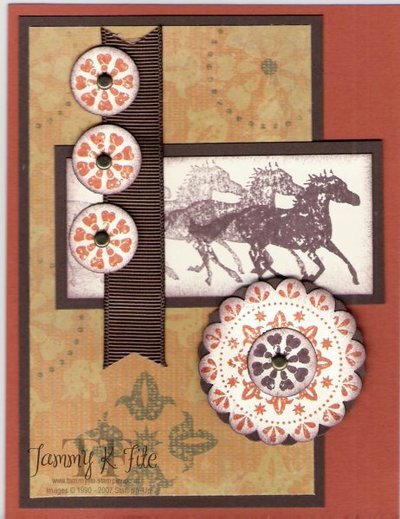 I used the Wanted stamp set and the Outlaw Designer paper. Wasn't sure about this set when I first saw it, but I am really having fun with it! It's easy to use, and has several different sized stamps, so you can always find what you need!! The colors used are Really rust and Chocolate Chip. Again, I used the designer paper to help me choose my colors!! Makes like so simple!! I used the Carte Postale stamp set--an old favorite! 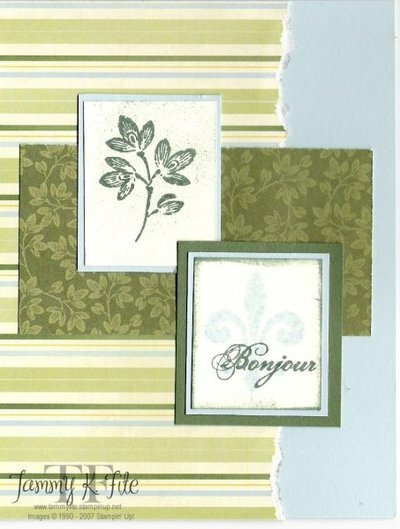 I actually meant to use my new "Priceless" set, but then picked out the Le Jardin designer paper--then I had to use Carte Postale!! (I'm an "in the box" stamper!! haha!!). Colors are Soft Sky, Always Artichoke and Very Vanilla. I hope you're all having a great day! I think I'm going to go shopping now--maybe I'll find some inspiration at the stores!! This is such a fun idea!! I first saw it on Courtney's blog (http://createdbycourtney.blogspot.com/), and wanted to do it, too!!! For the first 10 people that want to play and "pay it forward", I will send a a handstamped card, along with some stamped images to use as well. Just leave your email address in the comment so that I can get in touch with you!! Remember, you have to "Pay it Forward"--which simply means, you must send a card to someone else!! So simple, but it really makes a person's day!! Here's a very simple card for the fall!! I used the Autumn Harvest stamp set from the upcoming Holiday Mini catalog! I stamped both the leaves and the pumpkin with Basic Black. Then, using the watercolor crayons, I colored the pumpkin. I used the aqua painter to blend the crayons. Then, just tied a ribbon around!! Quick and easy!! Good evening!! Here is a card made using the Wanted stamp set! It's a lot of fun to play with!! Once again, I used colors from the Outlaw Designer paper: Sage Shadow, Really Rust, Chocolate Chip & Creamy Caramel. The "So Kind" is actually from the Priceless stamp set! I also used the wide chocolate grosgrain ribbon--LOVE it!!! It's attached with Sticky Strip, but then I added the large eyelets for a little something!! What do you think? Sorry no stamping today! Today is Brandon's 10th birthday!! My baby has entered the double-digits!! I can't believe it!! How did I end up with a 10 and 12 year old, and me only 27?!!! haha!!!!! I came across this blog today. This lady is absolutely hilarious!! Please check it out! No, it isn't stamping related, but if you need a laugh, she'll provide it!!! Just click here. Have a great day, and I'll be back to stamping soon!!! 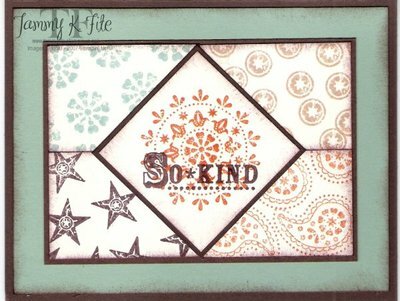 Yes, I have finally participating in another challenge on Splitcoast Stampers!! It's been awhile, and I've missed doing them!! But, sometimes life gets in the way!! haha!! I used the "Wanted" stamp set--UPS just brought it today!! Colors used: Chocolate Chip, Really Rust, Creamy Caramel & Sage Shadow. My colors came from the coordinating Designer Paper "outlaw". I love the paper, and the colors work so well together!! 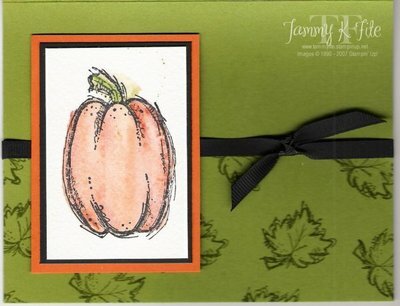 This card was made with the Autumn Harvest set (from the upcoming Holiday Mini Catalog). Colors used are Old Olive, More Mustard and Ruby Red. The ribbon is from the "Theater" Ribbon Originals collection. Very pretty!! Happy Stamping!! Think cool thoughts!! I made this gift card holder for the Assistant Principal at our elementary. She's a wonderful leader, and a very special person. She is leaving for another school, so we (pta) wanted to give her a going away gift. We sure will miss her!! 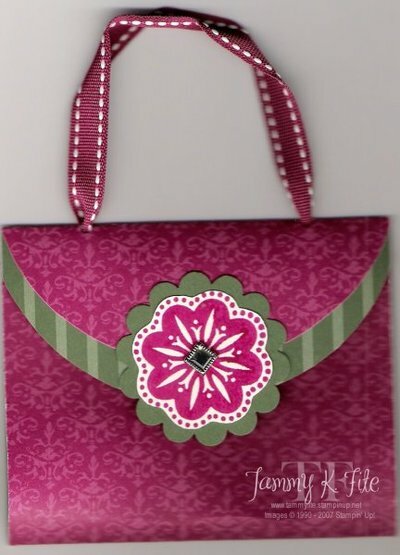 I used the Holiday Harmony Designer Paper from the Holiday Mini catalog. (if you'd like a copy, drop me and email, and I'll get on in the mail to you!!). The stamp set used is Baroque Motifs (I hardly ever use this stamp-hahahaha!!) I used Always Artichoke and Purely Pomegranate classic inks. The Rhinestone in the center of the medallion is one of our new Rhinestone brads in green. It's hard to see in the picture, but it adds just the right amount of "bling"! !